If you’re a homeowner, you’ll definitely have a heating/cooling system installed in your home. Based on your location, home size & other factors – the type of heating/cooling system would vary. In this article let’s learn more about types of heating/cooling systems and how to identify the one you’ve in your home. Basically, we can classify heating/cooling systems into two types based on the stages of heating/cooling provided – they are 1) Single Stage and 2) Multi Stage – heating/cooling systems. Let’s see them in detail. A heating/cooling system is technically known as an HVAC system (Heating, Ventilation, Air Conditioning). A single stage HVAC system has only one stage of heating or cooling output. They are either running at full capacity (ON state) or not running at all (OFF state). A multi stage HVAC system has more than one stage of heating/cooling output. The most common multi stage system is Two stage heating/cooling system – which has two output levels of heating/cooling. A two stage HVAC system will have a low setting & high setting suited for moderate climate conditions & extreme climate conditions. If the winter/summer is not on the extreme side, you just need to run your two stage HVAC on “low setting” which will adjust your room temperature gradually. If the climate is on extreme side, put your 2 stage HVAC on the “high setting” which will adjust your room temperature quickly. Other than two stage systems (the most popular and common model), there are three stage & four stage systems – in multi stage heating/cooling systems. The cost of the system increases with the number of stages. In North America (USA & Canada), most of the homes runs on single stage or two stage heating/cooling systems. Single stage systems are the least priced & easy to install. But they’ve the disadvantage of lesser fuel efficiency & uneven heating (recall they are either running at full capacity or OFF). Two stage systems costs high to install (& setup) but they are highly efficient (fuel costs would be lesser) & they provide even temperature to all rooms. Do you know which type of HVAC system are you having in your home? If not, don’t worry! We will help you identify your type of heating/cooling system. 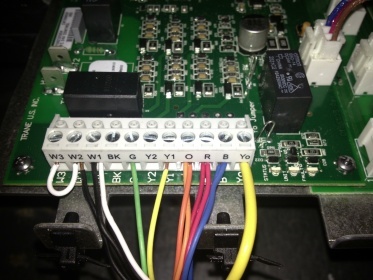 How to identify your heating/cooling system ? The very first step in identifying your hvac system correctly is to first check if you are having a line voltage (120V/240V) system or low voltage (24 volts) system in your home. If you have a line voltage system, you probably have an electricity based heating or air conditioning system in your home. In such case, you would be having a baseboard heater or a forced fan heater or a wall heater in your home. Now if you have a low voltage system in your home, you would be having a furnace based system, or a boiler system or a heat pump (this could be single stage or multi stage). Now how to identify if you have a line voltage system or low voltage system? This is very simple – just check your thermostat wiring. 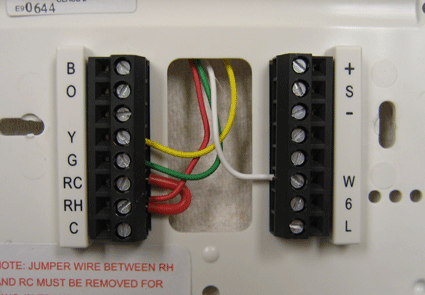 The easiest way is to check the backside wiring of your current thermostat. If you have a line voltage system, your thermostat (which would be a line voltage thermostat running on 120 volts/240 volts) would have either two or four wires coming out of its backside. These wires will be thick (just like your mains line wire) and the color of wires will be either Black & Red or Black & White. If you have a low voltage system, your thermostat (which would be a low voltage thermostat running on 24 volts) would be having 2 to 9 wires (or more) on its backside – which will be very thin sized and the wires will be having different colors like Green, Yellow, Red, White etc. Read our complete guide on how to identify between Low Voltage & Line Voltage Systems. In America, only 10% of homes runs on line voltage system (electricity based systems). The big majority (about 90%) of homes in USA & Canada runs on central furnaces, boilers or heat pumps – which are low voltage systems (which don’t need electricity to produce heat) and these systems are controlled using low voltage thermostats. These type of HVAC systems would be using a central furnace (in most of the cases) or a central boiler or a heat pump. In some cases, a combination of furnace & heat pump is used to setup the HVAC system. In any case (be it a furnace or boiler or pump), your HVAC can be either single stage or multi stage depending upon the levels of output provided by your system. This means it is possible to setup single stage or multi stage system using furnace or boiler or whatever source of energy. Our objective here is to identify if your system is Single stage or Multi stage – we are not bothered about if you have a furnace or a boiler. Let’s see how we can do it easily! For this case also, lets grab the thermostat and look at its backside. Take the base off your thermostats and look at the wires. Check the wires going into terminals W, W1, Y and Y1 in particular. Conventional Single stage systems – will have one wire leading into W or W1 terminal (for heating) and one wire leading into Y or Y1 terminal (for cooling). So that’s the easiest way to identify single stage conventional hvac systems (which would be furnace based or boiler based). Single Stage Heat Pumps – will have only one wire (for both heating and cooling) leading into Y terminal. Note: If the heat pump has emergency heat/auxiliary heating facility, you will find a wire leading into AUX terminal. 3 Stage conventional heating system – will have wires leading into W, W1 and W2 (or W1, W2 and W3) terminals of thermostat. Note: This image given above is of a thermostat which supports 2 stage systems (2H/2C – 2 stages of heating(W1, W2) & cooling (Y1, Y2) in a single thermostat). But this thermostat is actually wired as 1H/1C system as there is a jumper wire connecting W1 to W2 and another jumper wire connecting Y1 to Y2. This could be because the HVAC was either single stage or they want to use only 1 stage (possibly the moderate setting) of the 2 stage HVAC system. If the HVAC was a two stage system, we would have seen two separate wires going into W1, W2 and another two wires (if the system has air conditioner) going into Y1 and Y2 terminals. Note: This image above is a thermostat that supports 3H/2C. But it is wired for as 2H/2C (2 stages of heating & cooling). 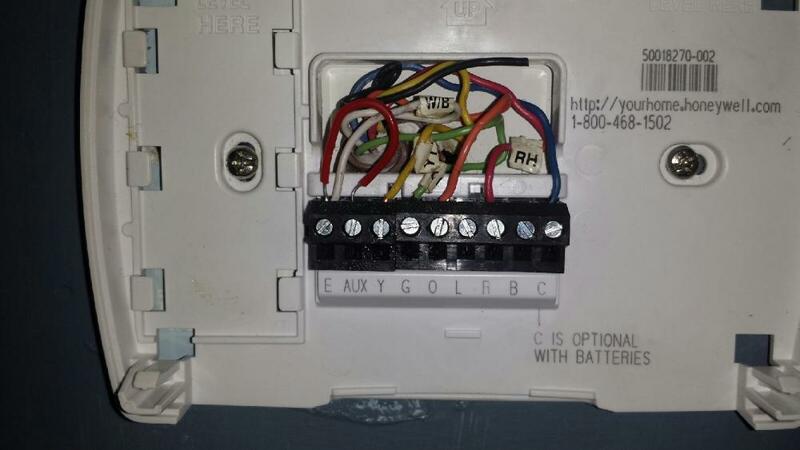 You can see the jumper wire connecting W3 to W2 – which wires the thermostats as 2H. In some cases, a thermostat will be having two labels at the terminals (as shown in image below). One set is for conventional systems (furnace or boiler) and the other set is used if you have a heat pump. Note: In the image above, even though the wires are coming out of label marked “conventional” – this thermostat is actually wired for “heat pump”. So be informed, in this type of cases you can’t judge your HVAC system just by looking where the wires are coming out from. You need to have an idea of wiring diagrams in this kind of cases. Hi, Matthew — I have the exact wiring as shown in your last photo (wired to conventional, even though I have a heat pump). The orange goes into W and the white goes into W2 (with a jumper cable between W2 and Y2. Does this indicate 2-stage heating and 1 stage cooling? I’m confused, because my upstairs thermostat has the white wire going into the W and the Orange going into the W2 (with no jumper between W2 and Y2). Both work off the same system (only one unit). Rob, I am also not sure 100%, but I believe it is wired as 2H/1C – 2 stages of heating and 1 stage of cooling. You’d better show it to a technician and make the final call. I’d be glad if you can reply here as well (after inspection).